Pure silver coin made fro .999 pure silver. Each coin is inscribed with hindu god and goddess. 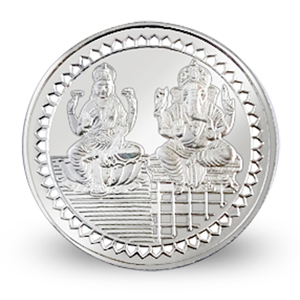 These silver coins are considered very lucky during the auspicious occasion of Dhanteras & Diwali. Diameter: 0.9 inches approximate - around the size 5 cents coin. *Price is for each coin. If you do not specify your choice of engraving on the coins, we will ship what is available in stock. Note: The actual design pattern may vary slightly from the picture. If you do not specify your preference, we will ship what we have in stock. This coin comes in either a see thru box or a organza gift bag. Buy 12 or more to save $1.00 on each coin. Buy 24 or more to save $2.00 on each coin. Silver coins are considered ideal return gifts on wedding, engagements, baby shower, new ventures, indian wedding return gifts for guests and many other occasions. They are also widely used by hindus for Diwali Pooja. Made in India. This item in Silver Idols, Statues & Coins category was first added to our catalog on 06-28-2017. Buy Pure Silver Coins Inscribed w/ Ganesh * Lakshmi 5 gms, sold & shipped by Yaadein where you can shop online for Pooja Samagri, Hindu Statues, Puja Items, Religious Gifts & Home Decor. This Pure Silver Coin collection has been tagged as Ganesha Lakshmi Silver Statue, Ganpati Wedding Return Gift, Krishna, Return Gift, Chandi Ka Sikka, Cheap Coins, Holiday Diwali Gifts, Statue, Corporate Gift Item, Baby Shower, Hindu Religion, Festival Shopping, Return Gift Set, Hindu Deity, Diwali Gift. Thanks for your inquiry. We do not do any customization on silver coins. They are .999 pure silver and already made.